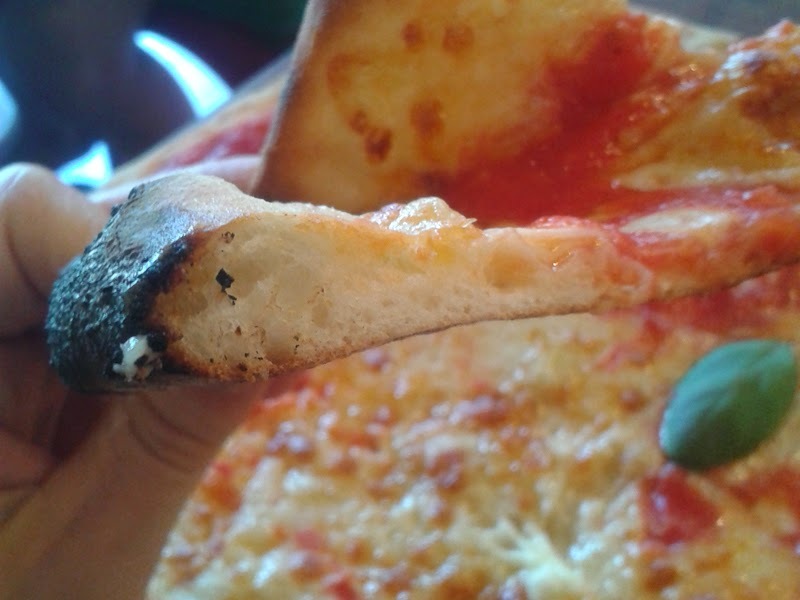 Currently I'm conducting an almighty Brighton pizza review post where I am visiting the main pizzerias to find out if anyone can make the darn things. As you can imagine, I'm kissing a lot of pizza frogs in search of a prince. Also what I'm finding is that there are few nice venues to eat pizza and fewer wood ovens, but this is one of them so I thought it deserved a post by itself. 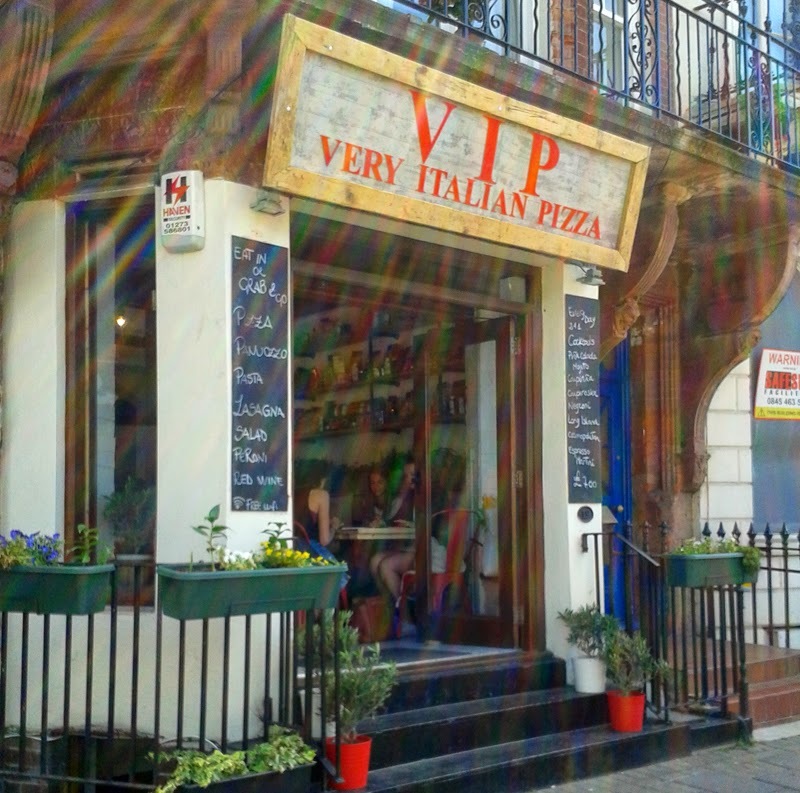 VIP Pizza cropped up a little while back in the same location as Oregano, who also served wood fired pizza with a bit of a hit and miss reputation, more often missing on my visits to be honest. But VIP has transformed the space. Gone is the heavy wood and the daft huge tables that minimised dining space. They've successfully achieved a modern take on Italian tradition style with a little industrial edginess thrown in to boot. Good quality produce lines the shelves and the troughs of herbs behind the seating benches are a nice touch. 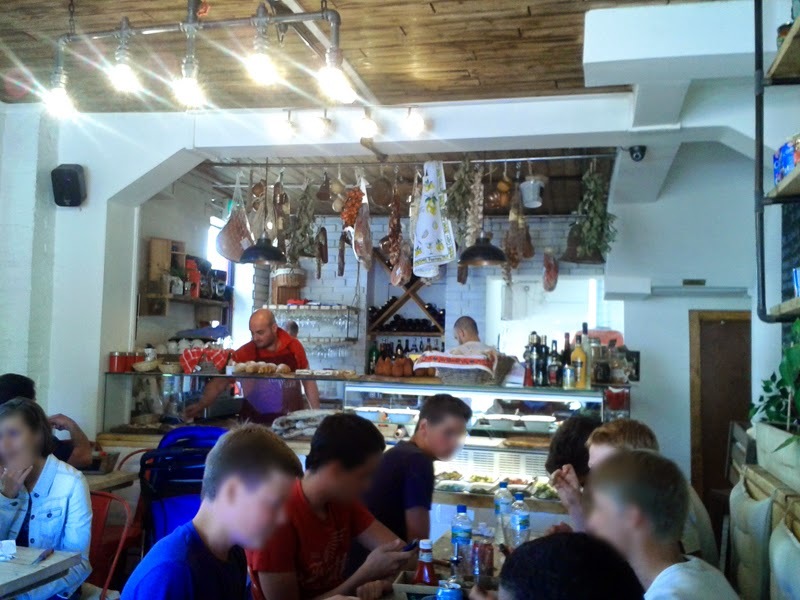 They also have a deli counter with hard to find meats like speck and I saw some regional Italian specialities like the coned arancini, smoked scamorza, jam crostata, ciabatta and some cakes that may be worth a look in, especially for impromptu summer picnics on the Old Steine lawns. It’s been said that this is the place where Italians go and yes the place was positively bursting at the seams with Italian students. There were also a couple of Italian families and their beautiful babies who were gurgling away happily as they gnawed down their little pizza slices. The owners shouted out a few ciao’s to passing countrymen too. Quite a good sign. The pizza menu is quite large with almost 30 choices, mostly good although was sad to see the Hawaiian and the chips and wurstel topping which is more popular with the Italian youth than would like to admit to. They also serve a panuzzo, which is a relatively new thing and something not really seen in the UK. 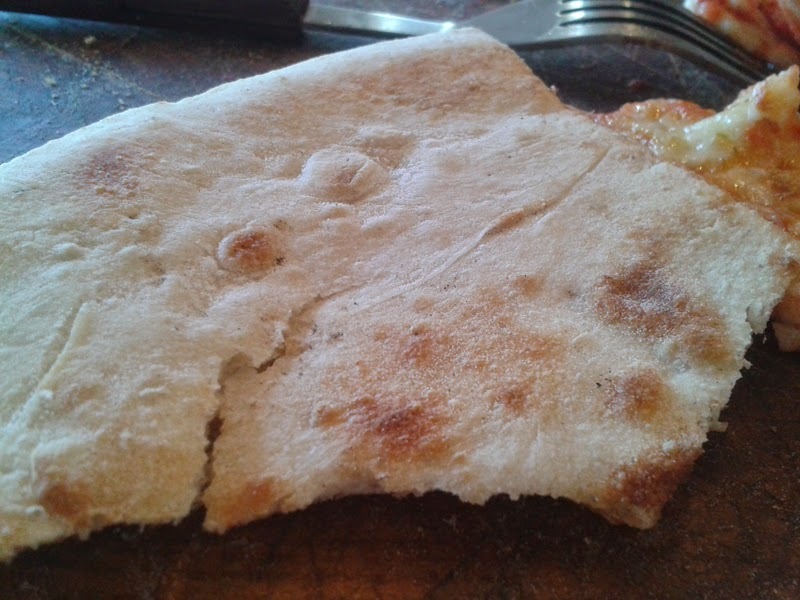 It's a pizza base that's folded and stuffed but not a calzone but more like a filled sandwich pizza. As I've said before I always opt for a Margarita on a first pizzeria visit. 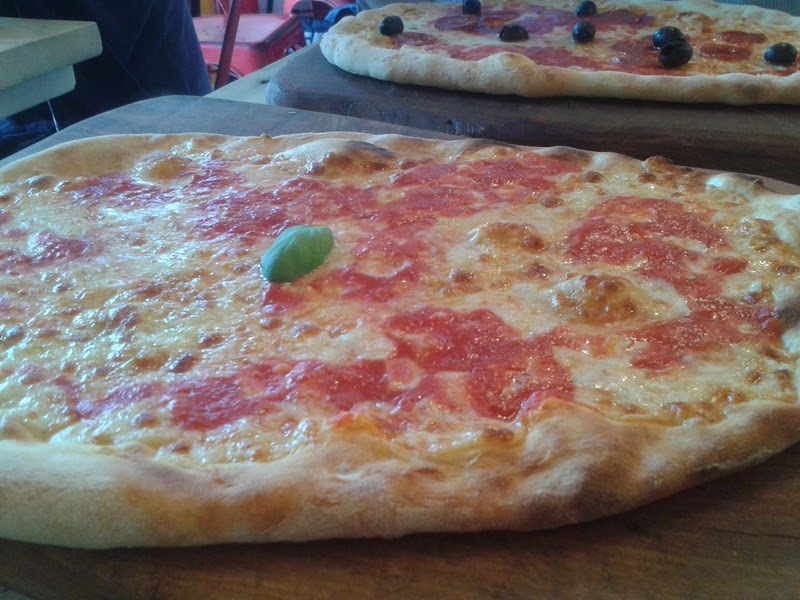 Mr GF went for a Diavolo, much the same just with some spicy salami and black olives on top. The dough was well seasoned and a good consistency (the cooked bit anyway). I still think there was far too much cheese, despite making a point when being served to lay off it a little, but the sauce was nice, the right amount and good quality. I’m not one of these people that nods like a Churchill dog when asked if everything is alright with my food when I have a quibble, especially if I’m writing about it after. That just isn’t fair. When asked I did point out the pizzas were undercooked, mainly on one side as they hadn't been turned in the oven (burnt on the other), and I was told quite flatly that I was wrong, they were perfect. Instead of infuriating me I did have to chuckle as I then KNEW for sure I was in an authentic Italian place. That is precisely the reaction you would get over there! Despite half of it being slightly doughy and the cheese on Mr GF's not even melted, it had all been a figment of my imagination. Of course! God bless the Pope. I did show the pictures to a professional baker I happened to be meeting and they did say the dough didn't look too bad, it had just been undercooked. Looking around at other people's orders I do think we got a swift cook as the other pizzas seemed just a little more crisp and had they been then it would have helped. The arancini, shaped in a traditional cone rather than ball, were absolutely delicious. Nicely firm and filled with the classic pea and meat sauce combination, which was tasty and well seasoned. These really were as mamma would make them if your mamma was particularly gifted in making them. Be sure to grab one of these if you see them on the counter. So, not altogether bad and the good outweighed it. There is a good selection of beer and wines, and San Pelligrino soft drinks, even Crodini which you don't see often too. 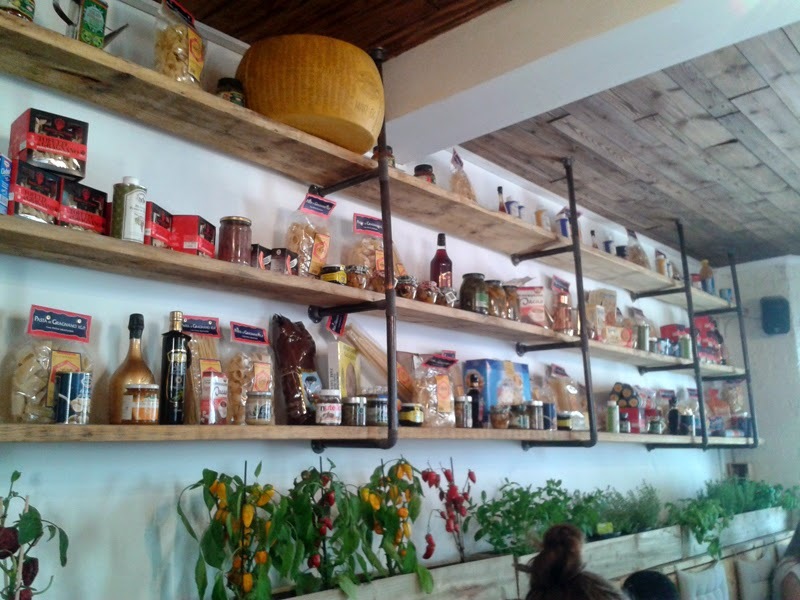 They also do pasta dishes which looked popular and there is a selection of antipasti. One thing though is that I would strongly ditch the mayo and ketchup from the tables. I was quite shocked to see them on there to be honest. If heathens request it they can jog on down to Dominos I say. Clearly it's going to attract the students and a younger crowd in general due to the natural lower price point. Their money is better spent here on fresh produce than some chain fast Frankenstein food anyway. Prices start at just £5.50 for the basic to £12 for porcini and truffle toppings. Service is friendly (as long as you don't complain about anything!) but can be a tad too slow for working lunchtime turnarounds. You can also just grab a slice to go too. There's clearly been a lot of love and time invested in this place which you can't help but admire. If you want your pizza served in an Italian atmosphere by real Italians then this is the place for you in Brighton town centre.